(Today's guest review is by Jay Diamond, whose latest blog is These American Roads). On a day like any other, I'm walking in the NYU village past all the advertisements -- pasted, posted, and painted to walls, trash-cans, and even the sidewalk -- that lure unsuspecting undergraduates into schemes, scams, and sales. It's an interesting juxtaposition, the Madison Ave. machine next to the D.I.Y. aesthetic, both (illegally) posting their brands on public and private property. I turn off Broadway past a building undergoing another facelift in order to entice the high schoolers considering New York as their college destination, and possibly to convince their parents this isn't the urban war-zone that popular culture portrayed it as many years ago. And while seeing a building being renovated is common for any walk that lasts for more than two-blocks, something about this particular job catches my eye. More precisely, on the side of the dumpster collecting the scraps from the workers above, spray-painted in neon green, I notice a familiar phrase: "Who will watch The Watchmen?" Ten seconds after the tinge of curiosity wares off, I think to myself that this tag is either the work of some wanna-be vigilante who plans to emulate characters from the graphic novel Watchmen, some over-zealous fanboy of said book, or a guerrilla-marketing campaign cooked up by an advertising firm trying to do something "edgy" to attract attention to the then-upcoming film-adaptation of the above-mentioned Alan Moore graphic novel. My best guess was one of the latter two, and it seemed like a sad fate for such an edgy piece of work. Something tells me that while the comic Testament, whose 22 issues were recently condensed into the fourth and final part of a collection, comes from the same school of subversive thought as many of Alan Moore's works, it is, in its disgust for the state of our culture and humanity, much more of a morality tale. That isn't surprising considering the fact that the writer of Testament, Douglas Rushkoff, juxtaposes stories from the Old Testament with a narrative that takes place in a near-Orwellian future. Whereas Moore's work holds out little to no hope, for Rushkoff it's precisely his optimism -- the desire for his characters, and humanity as a whole, to better themselves -- that is one of the series' greatest strengths. Abraham, Joseph, Job, and some other familiar stories are delivered alongside the tale of a modern group of malcontents struggling to fight a government controlled by corporate interests. Told alongside correlating biblical passages, Rushkoff illustrates history's curious disposition to repeat itself. But through this repetition, there is room for change. And while taking artistic cues from The Bible is not a new idea, it's Rushkoff's comic book medium sets it apart (even though much of the Superman story could be seen to have many religious parallels), but also places it alongside films like Strange Days, and of course The Matrix might be the best comparison, with its story of renegade cyberpunks fighting against an army of robots that has rendered mankind into docile state through a simulated reality. Due to greed, it isn't machines needed for human energy. In Rushkoff's vision, though, this seems to be the long march humanity is headed down. Aside from the obvious fact that Testament is a comic book and The Matrix a film, one huge difference is that the latter calls upon a multitude of different philosophies from various cultures and religions to weave the tale of a human exodus that stems from an atheist prospective, whereas Testament relies on an ongoing dispute between several Hebrew, Egyptian, and Phoenician deities, and portrays this as the cause of many of humanity's problems. 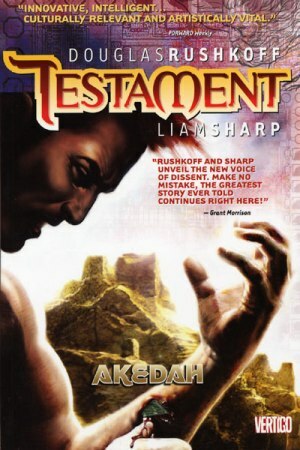 To his credit, Rushkoff never seems to get into a "right or wrong" argument (even though it's pretty easy to find oneself siding with the Judeo-Christian figures opposed to the aliens requiring child sacrifices), but does rely too much on the individual messianic approach that is obviously thrust onto main character Jake Stern from the very beginning of the series. I suppose as this is a story of the power of the human spirit to overcome evil, a savior figure is about as necessary as it is the cornerstone of The Bible's Old and New Testament. Aided by artist Liam Sharp, Rushkoff strikes an extremely careful balance between his own intellectual background and the role of storyteller. As a fan and admirer of Mr. Rushkoff's many books and regular contributions to Arthur Magazine, I can't help but notice that the series Testament works as just that: a testament to the canon of ideas and subsequent writings that have flowed from the fertile mind of the man. In putting forth those ideas in the colorful panels of comic books, Douglas Rushkoff has not only given us a great work that is an extremely entertaining morality tale with sociopolitical themes that have been relevant for thousands of years, but is also one of the smartest comic book series that should be mentioned alongside the works of Neil Gaiman, Grant Morrison, and of course, Alan Moore. 2 Responses to "Sacred Cows and Graphic Novels"
doth pressage an advert on a torn poster for an exodus of us all. It's just that old familiar testament to the new revelation, that opiates are the opiate of the masses praying for a passage to anywhere before the traffic lights change direction. Living in the city's not Babylon; its just the habits of the inhabitants of another smaller Eden hustling for a bigger bite of an even bigger apple. apocalypse when it slaps you on the kisser. It's Woolworth's staying awake for,Saint John always knows a good score, he set his store by that. The reputation of his revelation stands and calls by that store. I read somewhere that in Testament, the human action takes places within the comic book panels, while the action of the gods takes place in the gutters between the panels. I think that's pretty cool. Of course, the cartoons of Sergio Aragonnes appeared outside the panels in Mad Magazine, but that was a whole different thing. It didn't have the same meaning of a "space out of time" that Testament apparently conveys.